A yacht charters and sailing vacations news blog from your charter yacht specialists, Paradise Connections, who are currently cruising about the Caribbean. A couple of our favorite motoryachts won top honors in the Concours de Chef Competition at the St.Maarten Charter Yacht Exhibition, Harmony and Touch. Congratulations to Chef Cameron Feldman aboard HARMONY for winning First Prize. Captain Jack McKay and his crew of six, will be chartering this 2005/6 winter season in the Caribbean. They will return for their second summer in the Mediterranean and be available for charter beginning around the end of June 2006. Harmony still has a few dates open for their Caribbean season, but we don't expect them to last long! Touch is a 120-foot motor yacht which accommodates up to eight guests in four staterooms, each with King-size beds. Touch, with Captain David Rutherford and his crew of six, will be based in the Caribbean this winter through the end of March 2006 and will be chartering in the Mediterranean for the summer 2006. Contact Paradise Connections Yacht Charters for more information. Paradise Connections attended the St. Maarten Charter Yacht Exhibition, that was held at the Yacht Club Port de Plaisance in Simpson Bay Lagoon, Sint Maarten, Netherland Antilles from December 5 to 8, 2005. This was the second year of the annual event and we feel they did a very good job and hope more yachts will enroll in next year's charter yacht show (more sail boats please). Once again, the show offered free wi-fi and complementary continental breakfast. It is a great venue for the charter yacht show as the airport, hotels, and a wide variety of good restaurants are close by (as opposed to the Antigua show). The folks at the St. Maarten Charter Yacht Exhibition also provided free water taxi service to travel between the various marinas, plus they scheduled shuttles to transport brokers from their hotels to the show. The evening events were fun and interesting... The Taste of St. Maarten evening allowed us to sample the fare of various, good restaurants from both the French side of St. Martin and the Dutch side of Sint Maarten, and we mustn't forget to also thank the companies that supplied beverages and open bar. The Yacht Hops are always enjoyable. M/Y Harmony definitely won the prize for most lively entertainment! Thank you for a job well done. We look forward to next year's show! 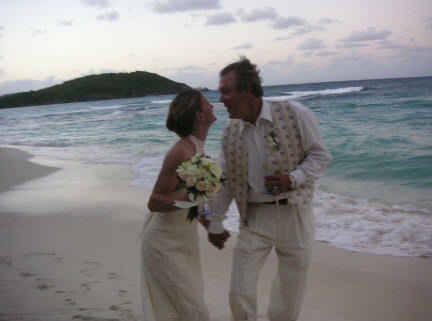 Leslie and Charles, owner-operators of the 51-foot charter yacht Phaedrus, were married November 27, 2005 at Hawksnest Beach, St. John, US Virgin Islands. Phaedrus is one of our favorite charter yachts with great accommodations and a fabulous crew. We love it when we are in the same port with them, as Charles is an excellent cook! Phaedrus has a special rate for honeymoon and anniversary charters: $5100/week, all inclusive. Check them out and give us a call! Or visit our web site paradiseconnections.com and send us an email! 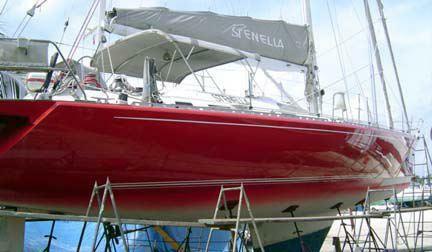 Stenella is in the boatyard getting all prettied up for the new season... Here's a sneek peek at her new paint job. KC wrote to tell us that they have given the galley a makeover as well with a new stove, microwave, floor, cabinets, wall covering, lighting, corian countertops, etc. They have also been busy revarnishing the interior, and installing new corian counters and taps in the heads. New upholstery, too! 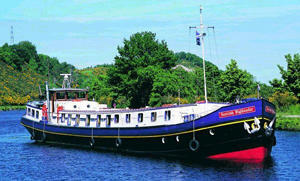 Looking forward to visiting Stenella at the boat show in November. 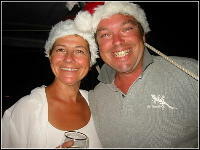 Dominique & Michel (Blithe Spirit) feeling a bit of Christmas cheer. SCOTTISH HIGHLANDER: 4-night Christmas cruise (December 23-27, 2005) in Inverness (Loch Ness) area of Scotland. 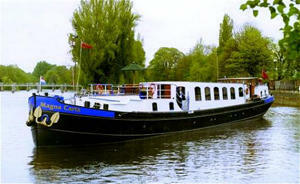 MAGNA CARTA: 10-night Christmas/New Year's cruise (December 23 - January 2, 2006) - From St. Katherine's Dock in London, to Chelsea, Chiswick, Runnymede, Hampton's Court, Windsor, Cookham, Marlow, Hurley, Henley-on-Thames. BUDDY gives his paw print of approval to TAZA MAS. Buddy is a two year old pug whose humans do everything possible to keep him happy. A veteran of many charters, Buddy loved his recent cruise on TAZA MAS, particularly the special meals Amy prepared for him, and the ice cubes Tiffany put in his water dish. Buddy had such a good time he has booked two weeks in June and one week in August. All information posted to this web site is presented in good faith and is believed to be accurate. However, there will be occasional errors and omissions and all information is provided on an "as is" basis. The user expressly agrees by using this site that the use of such information is at the user's sole risk.